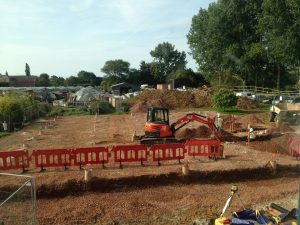 Work is in progress on a £1 million botanical-style restaurant at a Dorset garden centre after Malcolm Scott Consultants prepared detailed plans for an eye-catching design within an Area of Outstanding Natural Beauty adjacent to a major A road. 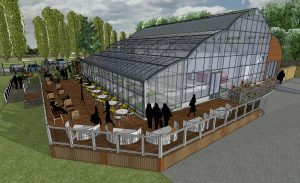 The restaurant at Groves Garden Centre in Bridport is currently being constructed with the help of detailed drawings prepared by MSC’s architectural technologist Alexandra Ginés Heiwegen, the firm of master planning consultants having secured planning permission for the 176-cover facility and other site developments. Chris Primet, of MSC, said: “There were a number of considerations in preparing this concept design. Firstly, the centre is located within an Area of Outstanding Natural Beauty, so we had to give careful consideration to ensuring that our proposed structure wouldn’t have a negative impact on that. The finished designs were created to catch the eye of the many thousands of people travelling along the A35 some 10 metres away, and use curved glass panes to complement the surrounding area. “The attraction of the curved glasshouse is that it presents a horticultural message, both in the way the surrounding tees are reflected in the glazing, and by way of the fact that diners can see through it to the landscape beyond. Charlie Groves, of Groves Garden Centre, said: “We were extremely pleased with the attention to detail in the plans that Chris and the team put forward for our striking new restaurant, and we’re excited to see the final construction. “With catering representing such a huge revenue stream for garden centres, and with our existing coffee shop being such an important resource for us, we wanted to maximise our customer offering while ensuring that whatever restaurant we unveiled would be welcomed by local residents.